I recently was teaching a private student how to paint Olives for a still life. She had no green suitable for the painting in her paintbox. No Problem! Another way to make greens is to mix Ivory Black with Yellows. You can get some really natural greens this way. So we used Ivory Black and some Cadmium Yellow Pale with a bit of white. Go easy on the white! I also have made wonderful olives using Yellow Ochre for my yellow in the mix. Until I moved into my current home, I was at the mercy of whatever light I could get from kitchen windows or overhead lights in my previous homes. I now have a studio with fairly constant overhead florescents that we installed into a room with south, east and west facing windows. I control the window lights with shades. I am currently using my living room for a studio. It is dark and depends on the outside light source. Here is what I mean about light being so important. This is Courtney. One day she was beautiful and then the next day, because it was overcast and grey outside, she grew a mustache and green flesh on her brow between her eyes. I will fix her as soon as I am back into the studio. Back in My Studio Again! My studio is now inhabitable again. Freshly painted walls and a new closet. I put my easel back in today and I will get back to work tomorrow. Awesome! 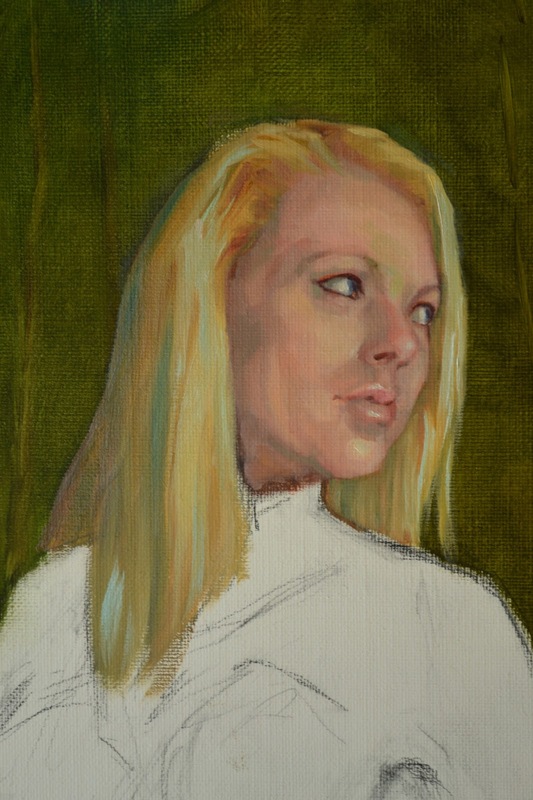 I won't show you the entire painting, but here is a sneak peek at the Dianna painting. This is one of her Dobermans. 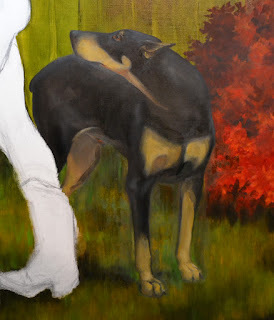 I just absolutely love to paint dogs and cats. I just finished and delivered this portrait of "Foster" to a client in Leesburg. Today I am doing the kind of painting I do best.........walls! Yes, the closet is now finished except for the trim around the door and baseboards. So, I am painting my studio, new closet and all. I will then be able to get back to work in my well lit studio. I have been trying to work on my Dianna painting in my living room, but just when I think it is going well, we get a cloudy day and I can't see well enough to continue it. I had her face looking so good one day and then the next, it was overcast and I ended up with mismatched areas on her face. I will return to the painting as soon as I can get back into the studio where the light is constant and bright. 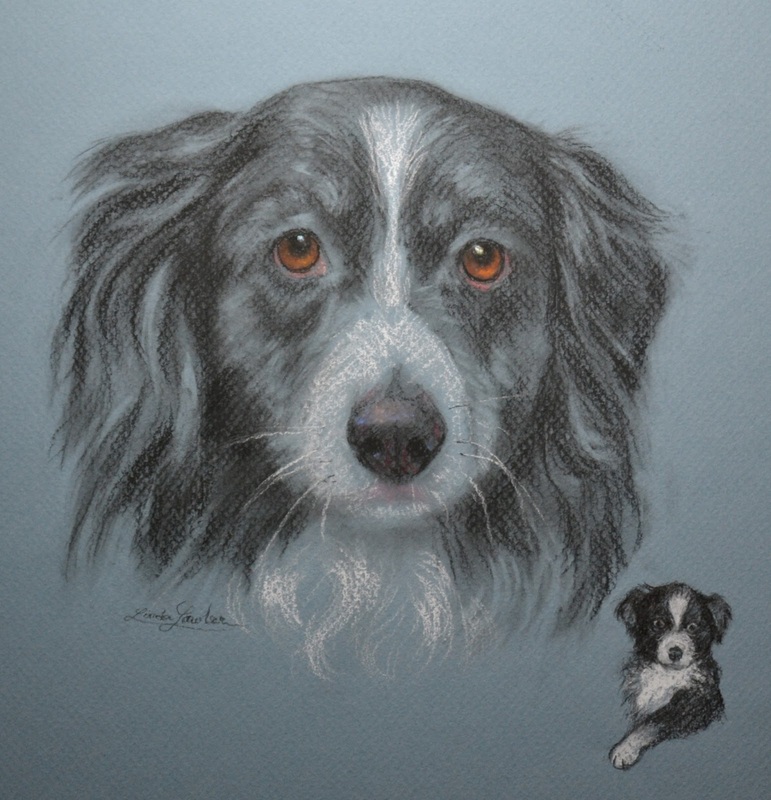 Another of my pastel pet portraits done just before Christmas. I am delivering another today in Leesburg and realize I did not bring the photo or camera. I will post that one tomorrow. I finally found a way to get the photos back onto my blog. I did this little guy just before Christmas. There is some sort of problem with the blog host and I am unable to upload pictures still. It's just as well. I really am under pressure right now to get the last painting painted and all the portraits framed. In addition to all the other life events going on, I have a few other art related commitments to fulfill. This blog really takes up a large chunk of my time, along with all the other computer stuff. Oh how I long for the good ole days, when all an artist had to do was Paint! OK, 2013 is not looking so good.......I can't get my computer to upload some photos of pet portraits I did just before Christmas. When I get it worked out, I will post the two best that I did this year. Did not post them before, as the clients were giving them as gifts and I did not want to chance spoiling the surprise. Also, I seem to have that stomach bug that is going around. First my husband was sick, now me. DRAT! I was supposed to work in the Leesburg studio today. Instead, I will just stay on the sofa and look at my drawing of Dianna that is now on the linen canvas I stretched. I added her two Dobermans and I am loving it. Lets hope I don't spoil this one. I have set up my studio in my living room until the renovations in my studio are completed. We are adding a closet in that room and it is a mess. It's also too dangerous for my precious linen. I can just see in my mind, my husband putting a 2 x 4 right through the center of Dianna. Nope, not gonna chance it........I love this guy, but he is definitely a bull in a china shop! I know lots of artists like to lay a drawing flat when they work on it, and I used to do the same. I have long since switched to placing my drawing surface on my easel attached to a strong board for stability. If I draw on a flat surface, there is a problem with foreshortening I don't see until I stand the drawing up and view it in a vertical position. Its as if the figure I am drawing was seen horizontal and all the body parts were foreshortened accordingly. I think I will do a demo of this shortly so that I can illustrate to my students what I am talking about. Hey, forgot this yesterday when stretching the canvas.......ever notice how art materials from different manufacturers are not compatible to one another? It really torks my engines when I go to stretch a canvas and I only have two bars from one company and then two bars from another company and they wont work together because they have the slot on the opposite sides of the bars from the other company's slot. It's as if they go out of their way to piss me off. So I am now having to order more bars from company A, just so I can use up those last two bars.......OH, and even worse, some companies will not let you order less than 48 stretcher strips, claiming they will get broken in transit if shipped in small quantities. Guess what two bars will get used as tomatoe stakes this spring????? I actually have cheated a bit....Instead of one new piece, I started two using the same model, but in two different poses. One is for the Gods & Goddesses show, gonna be a big one! And the other is gonna be for my Sci Fi Illustration portfolio, 18 x 24. The drawing yesterday still looks good to me this morning. Hurray, that almost never happens. The large canvas I stretched is for the Goddess. Her drawing will be done directly onto the canvas. The goal today, get my studio set up to begin the painting on canvas, and get the drawing onto the canvas. We are constructing a closet in that room and things are a mess, tools everywhere and not much space for me to work. I may have to set up the easel in my living room, aaakkk! Gotta run, husband needs breakfast and a lunchbox packed. My superstition is that, what you do on New Years Day is what you will do throughout the rest of the year. So I vowed yesterday that today I would create art, hopefully to start a new major piece and to eat nothing that was remotely chocolate. I would love to drop a few pounds this year. OK, so I did a preliminary drawing for a new piece, not too bad either. But, I blew it on the chocolate issue. Got a beautiful Harry & David gift box from my son and daughter in law......contained some irresistable chocolates. YUMMMM! Now, off to stretch a canvas before the day ends. Happy New Year and Great Art Making!